Dr. Ibrahim Abu Hashhash, a professor of modern Arab literature at Birzeit University, was awarded the top prize of the Sheikh Hamad Award for Translation and International Understanding in the category for German-to-Arabic Translation. Abu Hashhash translated Ernst Cassirer’s “The Philosophy of the Enlightenment,” one of the most influential books on the history of Enlightenment philosophy. 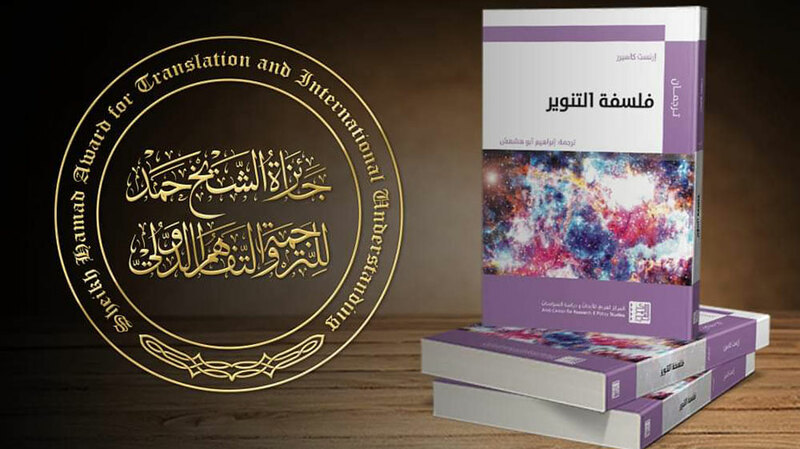 The translated version of the book is published by the Arab Center for Research and Policy Studies. The book investigated the dialectic relationship between politics and morals through the formation and variables of power structures. Cassirer was one of the foremost European intellectuals who immigrated to the United States in the interwar period because of his objections to the extremism that pervaded that era. The Sheikh Hamad Award for Translation and International Understanding was established in Doha, Qatar, in 2015, and is an international prize that seeks to honor translators and acknowledge their role in strengthening the bonds of friendship and cooperation amongst people and nations. It encourages creativity, upholds the highest moral and ethical standards, and spreads the values of diversity, pluralism and openness. According to the Sheikh Hamad Award website, the top total value of the award is two million US dollars, divided into three categories: Translation Prizes (US $800,000), Achievement Prizes (US $1,000,000), and Prizes for International Understanding (US$200,000).